All parts of the Special Reports section require an Omnia subscription. For more information, click Gain Access from the menu bar or, if you are already logged in with a news subscription, on the Upgrade button. Import breakdowns for upholstery, wooden seats, kitchens, bedroom, living and dining cabinet, mattress supports, foam mattresses, sprung mattresses, lighting, bedding, vinyl flooring, tufted and woven carpet and wood flooring. Includes August figures and year-to-date totals. 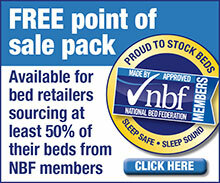 Bensons for Beds opened a net six stores in the first half to bring its portfolio back to approaching historic levels (Omnia subscribers). The UK upholstery market grew 3.3 per cent in 2014. Report features total market size, market share by supplier, source country, and major retailers’ share. Buying Lucas of Aylesbury in late May added to three Stokers stores and half a dozen more in the group trading under other store fascia. In 2004, UK buyers spent £14 on Italian sofas for every £1 spent on one made in Poland. But figures for the first half of 2015 suggest Poland could be about to overtake Italy as the main EU source for British upholstery retailers and wholesalers. An overview of bedroom cabinet imports into the UK in the second quarter of 2015, looking at year-on-year shifts in the amount bought from key trading partners. Investors are backing the expanding upholstery retailer Sofaworks’ plans to grow its store network across the UK. The Furnishing Report examines the retailer making Neal the Sloth a household name. UK furniture factories hummed with activity in 2014, with exports reaching record levels and total output the highest since 2008. We chronicle the past nine years in chart format. A graphic highlighting the contribution made by Dwell and Sofa Workshop to the wider DFS group in 2013–14, along with the output of the retailer’s own factories. Data showing the five largest Far East furniture exporters of cabinet, upholstery and beds to the UK over the period 1996–2014 inclusive. A 10 page pdf white paper looking at the circa £1bn Decorative Lighting market, including an overview of the supply chain and industry opinions on issues the UK lighting sector is facing. A 25 page report examining insolvency in the UK furnishings industry through 2013, a year in which the sector lost 266 companies who — collectively — owed creditors £222m. This pdf report looks at all 266 companies, and shows who they owed money to. Ahead of ScS’ planned return to the stock market, The Furnishing Report takes a graphical look at the current structure of the UK’s second largest sofa retailer, which additionally sells carpets and runs a concession business for a major department store chain. Charts showing benchmark salaries across the home furnishings industry, spanning retail — covering both independents and national firms — upholstery, flooring, beds, case goods manufacturers as well as wholesalers. Charts and data showing benchmark gross margin and pre-tax margin for companies in the home sector, broken down by home furnishings retail, including both national and regional businesses, upholstery, case goods, importers, flooring and beds.